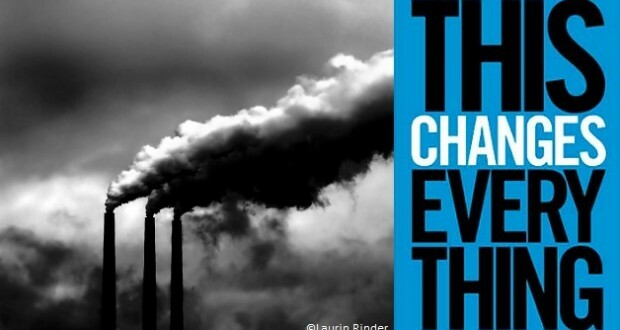 Naomi Klein’s newly published book is a welcome and much needed addition to the debates on how to tackle global warming. Klein not only outlines its enormous threat to humanity, but shows the need for a fundamental change of strategy to avoid disaster and instead seize the opportunity to “dramatically improve lives, close the gap between rich and poor, create huge numbers of good jobs” (p 10) and have a healthy planet to live on. To see climate change as an opportunity will seem weird to many mainstream environmentalists who are demoralized as, after over 30 years of talk, carbon dioxide releases continue to increase. Some are turning to desperate and dangerous ideas such as nuclear power and geo-engineering, while others are toying with the need for an eco-dictatorship. What Klein does so well is point out that the failure to address global warming over the last 30 years is due to using the wrong strategies and especially not attacking the root cause of global warming, and many of the other ills of the planet – capitalism. The book argues that global warming can only be defeated by an international mass movement that links the provision of good jobs and public services with the environment. To do this the movement must break with the rules of capitalism. This may be clearly understood by socialists; however, the book will take this debate to a much wider audience and increase the interest in the socialist alternative to global environmental catastrophe and human suffering. Klein uses strong, well-researched evidence and moving experiences to weave together her argument. Many of the stories of people and meetings are alarming or moving, inspiring or frightening. But they all help to make her case. Capitalism exploits both the ecosystems of the planet and people to make its profits. Mountains and forests become ‘overburden’ to be removed to get at the tar sands or coal. Humans are reduced to labor “to be brutally extracted” (p. 169) or excluded from society. 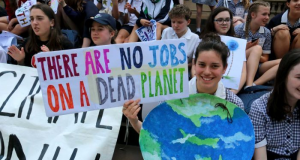 Governments have plenty of money – trillions of dollars – to bail out the banks but no money for green jobs or the public services to protect from and deal with the impacts of global warming. 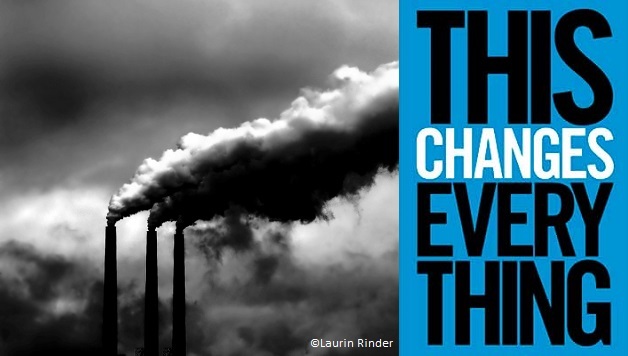 Neo-liberalism has increased the damage to the environment and social well-being. It has weakened the powers of civil society and governments to control, at least partly, the actions of corporations. Energy suppliers have been privatized so no longer have any regard for social or environmental issues. Neo-liberal ideology has captured almost all politicians so regulations or controls on corporations have been torn up. Agreements, such as NAFTA, are used to smash rules to protect the environment and jobs. Klein states the inconvenient truth that the support of Al Gore and the big environmental groups was vital to the introduction of NAFTA. 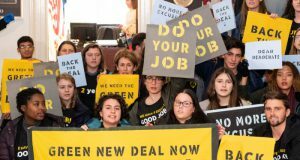 Klein criticizes the failing strategies of many of the major US environmental groups – Big Green she calls them – of working with Washington politicians and the major corporations, including some with the worst environmental records. Nature Conservancy, Conservation International, the Conservation Fund, WWF and the Environmental Defense Fund all have links, including donations and board members, with major energy companies, Walmart and other corporations driving climate change. This sleeping with the enemy means only advocating policies that produce a profit – such as supporting carbon markets, light regulations, consumer guilt, and fracked gas as a ‘bridge fuel’. None of these have tackled the problem, in fact they have made things worse and delayed implementing the necessary and existing solutions. Cap and trade and offsets are a big scam to make corporations richer and if anything do more harm than good to the environment. One example that graphically illustrates the toothless nature of all the international talk is that the fossil fuel companies have identified carbon deposits, still unextracted, of 2,795 gigatons of carbon which is on their books, worth some $27 trillion. This is 5 times the maximum amount of carbon that scientists say can be burnt by 2050 if warming is to stay below 2oC, the temperature at which the climate crosses a tipping point to disaster. The companies, as ExxonMobil stated, are confident that restrictive climate policies are “highly unlikely” and are “confident that none of our hydrocarbon reserves are now or will become ‘stranded’ [unrealizable]” (p 150). So big business base their business plans on cooking the planet for the sake of theirs profits. In fact the energy industry, rather than reducing the production of fossil fuels, is increasing production from ever more dangerous and environmentally damaging sources – deep water, the Arctic, tar sands, fracking – what Klein calls “extreme energy”. Much of this extraction has little or no regulation. The chapter on geo-engineering is scary. Ideas being seriously considered include: putting iron in the oceans to increase carbon absorption by marine organisms, putting mirrors in the sky or on the ground to reflect back sunlight, or constantly injecting particles into the atmosphere to reflect sunlight and add to cloud cover. The risks with all of these are immense and once in place how can they be reversed, yet companies, some scientists and environmentalists are seriously considering these steps. Climate change is due to more carbon in the atmosphere, the simple answer is to stop pouring out carbon. Geo-engineering does not tackle the problem; it would add another climate change in the hope of masking global warming. Fundamentally they would continue to treat the planet and all its life as an inert thing to be manipulated. The solution is not to ‘fix’ the world; it is to change the social and economic system that is making the only home we have unfit for us to live on. But profit comes first in the minds of politicians and corporations and therefore Big Geen. Often, environmentalists state that we have to ‘save the planet’ and therefore don’t have time for social issues. Klein argues that as capitalism is both destroying the climate and failing the vast majority of people on the planet there is the need, and the opportunity, for a plan to tackle both. The ‘jobs versus the environment’ claim is a lie, put up by big business to divide opposition to its rule. A program to heal the planet could provide millions of good jobs. 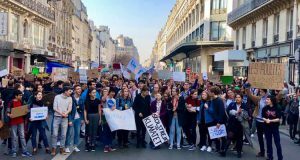 In contrast to the 30 wasted years of Big Green’s strategies, there is a growing mass movement of resistance to energy extraction and climate change. These movements around the world are cause for confidence about the future. Environmentalists, workers, indigenous people and social and economic justice activists linking together can consolidate and spread these struggles. Real progressive changes – ending slavery, workers rights, fighting discrimination – have always come from mass movements, not from lobbying corporations and politicians. Many in struggle are poor, workers and indigenous people. They need jobs as well as well as clean water, air and soil. It is not realistic or moral to ask the poor and workers to sacrifice for the planet. Big energy companies can wave bundles of cash as incentives to accept a mine, oil well or fracking rig. Workers would rather have clean, safe jobs than working in the dangerous and unhealthy energy business, and indigenous peoples would rather have a clean reservation than one contaminated with oil or with the mountain tops removed. However if the only choice is no jobs, go hungry and not be able to feed children or dirty jobs, many people will reluctantly accept dirty jobs. Why else do many people work in the Tar Sands? The fight for jobs and economic justice are an essential part of the fight for the climate. Climate change will only be stopped with a good jobs program. At the core is the need to fight capitalism and put forward positive alternatives. “The only people who will be truly empowered to say no to dirty development over the long term are people who see real, hopeful alternatives” (p 387). Klein is aware that huge changes are needed to the world’s political and economic system. She recognizes the need for mass movements but does not spell out the need for such movements to be independent of corporate political influence. To make the changes needed it is clear we can’t rely on the Democratic Party. The Democrats talk about their concern for the environment and unlike the right wing Republicans at least acknowledge the reality of global climate change. But remember it was Bill Clinton who brought in NAFTA which devastated jobs and the environment on both sides of the Rio Grande. Under Obama, despite the talk of lowering carbon emissions and reducing dependence on fossil fuels, the main “accomplishment” of energy policy has been the massive expansion of dirty energy including fracking and off shore drilling. In fact the US is about to overtake Saudi Arabia as the biggest producer of liquid petroleum. Ultimately the fight for green jobs and against environmental catastrophe requires breaking with the Democrats and building a new political party of working people and the poor, a party of the 99%. Klein reflects on other big progressive changes such as civil rights, but recognizes that many of these movements changed legal rights rather than economic inequality. The civil rights movement never won the good jobs, housing and education that people were fighting for. Movements that did change economic power, which she considers, include the abolition of slavery, the huge gains won by the massive wave of unionization after the depression of the 1930s and the socialist attempt of Allende in Chile, tragically crushed by a military coup. However none of these struggles abolished capitalism. The one example of a successful removal of capitalism and the establishment of new social and economic power was the Russian Revolution – which Klein never mentions although it is the example that most clearly fits what is needed today. In the first few years after the revolution there was a flowering of science including biology and ecology, art and culture, and human rights. Unfortunately, the revolution suffered from the devastation of World War I followed by the invasion of 22 capitalist armies trying to crush the revolution. The Soviet Union also suffered from low levels of education and technique in most of the country. Then, the isolation of the revolution due to the defeat of the revolutionary wave that swept Europe, laid the basis for the rising bureaucracy. This culminated in Stalin’s one sided civil war that destroyed the socialist revolution’s democracy and vibrancy and paved the way for the ecological disaster that was to follow. However, the Russian Revolution is still the best example of removing capitalism and replacing it with a much more democratic and egalitarian society. In today’s world with a much wider spread and higher levels of education and technique and much better global connections, the isolation of a revolution in one country and the rise of a brutal bureaucracy is very unlikely. While Naomi Klein is excellent at critiquing capitalism, especially neo-liberalism, at times it is unclear what she means by capitalism, is it only neo-liberalism, all capitalism or is it something wider which she calls extractivism. Let us be clear, it is capitalism, in all its different guises, with roots of problems going back in time to all class based societies. Klein also draws back from talking about a socialist alternative. Realistically the only way the steps she proposes can be realized — including green well-paid jobs, control of industry and finance, real community control of land and a “carefully planned economy” (p 94) — are by replacing capitalism with a cooperative collective stewardship of land and resources with benefits shared among people – a socialist world. Perhaps Klein’s unwillingness to talk about socialism is because she is unfamiliar with the Marxist criticism of Stalinism. She seems unclear about what socialism is, as she talks of “authoritarian socialism” in reference to the Soviet Union. That is a contradiction in terms; socialism cannot exist without a vibrant, healthy democracy. The Soviet Union, under Stalin and after, was not democratic nor was the planning based on an understanding of either the environment or a Marxist awareness of the deep connection between human well-being and nature. Klein makes a similar point but without the insights of Marxism. She states “living non-extractively does not mean that extraction does not happen: all living things must take from nature to survive. But it does mean the end of the extractivist mindset – of taking without caretaking, of treating land and people as resources to deplete rather than as complex entities with rights to a dignified existence based on renewal and regeneration” (p 447). Klein writes, for example of the need to protect soil fertility. Marx, over 150 years ago, wrote of capitalism mining the soil and that the response was another fix that actually creates future problems and greater problems. “Capitalist agriculture is a progress in the art, not only of robbing the worker, but of robbing the soil: all progress in increasing the fertility of the soil for a given time is progress towards the ruination of the more long-lasting sources of fertility. [Capitalist production is] simultaneously undermining the original sources of all wealth – the soil and the worker” (Marx, Capital, Volume 1, 1867). Responding to a problem with another technological fix, rather than addressing the root of the problem, whether using industrial fertilizer to deal with soil depletion or geo-engineering the climate (probably the scariest response imaginable) are built into capitalism. The misuse of science and technology and seeing humans as conquerors of nature are further reasons why capitalism is incapable of dealing with climate change. Engels pointed out that to “make the earth an object of huckstering – the earth which is our one and all, the first condition of our existence… was, and is to this day an immorality” (Outlines of a Critique of Political Economy, 1844). The reluctance to name the alternative to a human and environment-devouring capitalism weakens the book and weakens the movement to build the alternative. The movement to overthrow capitalism will need a mass movement around the world and a clear understanding of the enemy and what to put in its place – a socialist society which values the earth, its biodiversity and humanity. When earth is freed from the death cell prison of capitalism, then the skills, knowledge and imagination of humanity; the accumulated tools and resources of centuries of work; the boundless energy of the sun; and the fertility and diversity and of life will allow a world of full human development in harmony with a flourishing planet.